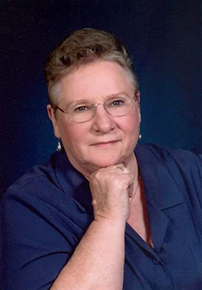 Margaret “Maggie” Rush, 76, of Kirbyville, passed away Thursday, January 31, 2019, at MD Anderson Cancer Center, Houston, Texas. She was born on March 2, 1942, to Otha Lucille Whitfield Martin and Grady Pierce Martin, in Dallas, Texas. Maggie received her Master’s Degree in Criminal Justice and retired as a Captain from the Jefferson County Sherriff’s Department. She devoted her time to playing the church organ and was a Master Gardener. Maggie was affectionately known as “Mama” to her grandchildren and will miss her puppy, Chubaby. Survivors include her son, Rodney Nobles and Crystal Baker of Beaumont; daughters, Laura Nobles and Diann White of Mount Vernon and Cori Stanley and her husband, Kenny, of Kirbyville; sister, Jan Caraway and her husband, Tommy, of Beaumont; grandchildren, Teresa Baggett and her husband, Jeremy; Julie Schultz and her husband, Kyle; Amy Nobles; Pam Stanley; and Trent Nobles and his wife, Angie; nieces and nephews; Shelly Kominczak and her husband, Marcus; Matthew Caraway and his wife, Margo; Holli Davis and Johnny; Grace Caraway; and Hannah Davis; great-grandchildren, Micah Baggett, Maggie Baggett, Jacob Stanley, Abbie Baggett, Aksel Schultz, and Wilder Nobles; and a host of other extended family. She was very excited about the announcement of two new great-grandchildren due this summer. She is preceded in death by her parents; husband, Cecil Farris Rush; and brother, Grady Martin. A gathering of Mrs. Rush’s family and friends will begin at 10:00 a.m. with her funeral service to follow at 11:00 a.m., Monday, February 4, 2019, at Broussard’s, 1605 North Major Drive, Beaumont. Interment will follow at Forest Lawn Memorial Park, Beaumont. Memorial contributions may be made to the American Lymphoma Association, 5433Westheimer, Suite 300, Houston, Texas 77056. We are so sorry to hear of Mrs. Rush’s passing. I know how much she meant to your family and the rock she was to so many. Our prayers are with you all for God’s comfort and peace. Maggie was an inspiration to All she knew. May she RIP.